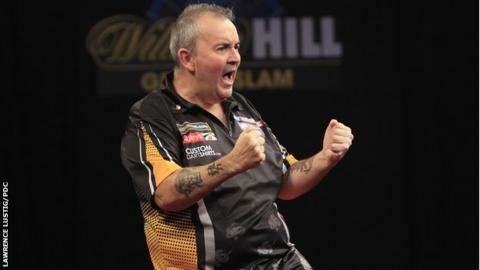 World number one and world champion Phil Taylor continued his exceptional run of form with victory at the Grand Slam of Darts in Wolverhampton. The 53-year-old from Stoke-on-Trent came through a tough semi-final against Adrian Lewis and defeated Scotland's Robert Thornton 16-6 in the final. Taylor has now won the Grand Slam title on five occasions and regains the crown he last won in 2011. He will go in search of a 17th world title in London next month. Before that, Taylor will defend his Players Championship title in Minehead. He has already won the World Championships, UK Open, World Matchplay, Sydney Masters, World Grand Prix and The Masters in 2013, and followed up those successes with another dominant display at the Grand Slam, which features players from both the Professional Darts Corporation and the British Darts Organisation. "It was a tough field and this wasn't an easy title to win," said Taylor. "The game against Adrian is probably the best game I've ever played in my career. It was a belter. "Robert put the pressure on himself in the final and he shouldn't have been 5-0 down, but that set the precedent for the match because he was the better player in the first five legs and I was 5-0 up. "I'm very chuffed with the whole tournament because it's been a great event. The atmosphere's been great, the crowd have been great and some of the players have really come back to form, like Robert, James Wade and Gary Anderson." Thornton, the 2012 UK Open champion, added: "I missed a few doubles at the start and Phil took advantage of that. "My overall performances were steady and it's hard to put into words what it means to reach the semi-finals and final. I think I surprise myself sometimes."